This model is designed as a children's design with a shorter and smaller 48 inch length to the table. 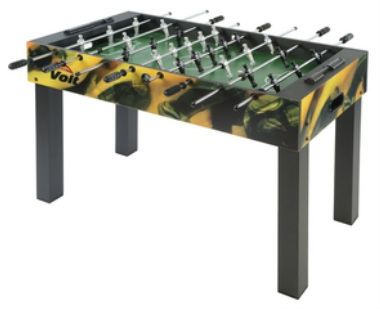 It offers a great price point for a table if you are looking for a gift for young children, but we wouldn't recommend it for adults who want to play a real game of foos. Equipped with end ball returns, rubber grip handles, 3 man goalie and an outside graphics package, it offers some of the entry level features we find on tables for this price point.